Published in AFAR.com (US). Are you fed up with trying to get your kids to eat properly with their knives and forks? 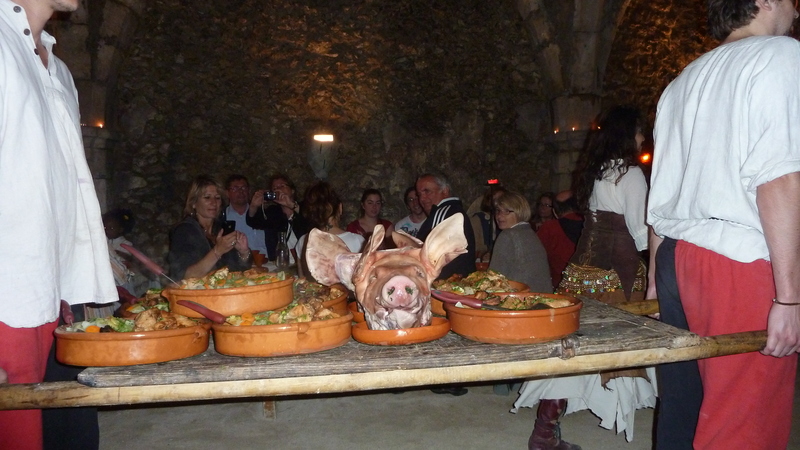 Why not give them a night off and take them to the most authentic medieval banquet in the world. At the Banquet Des Troubadours in Provins, an hour by car from Paris, fingers are the cutlery of choice; there’s not a fork in sight. Held in a cavernous 12th century vaulted cellar, at long wooden-benched tables and sandy floors, tourists from around the world gather to feast for lunch or dinner. A fool in red leaps out from behind an ancient column, the bells on his hat and boots ringing as he prances around the room, announcing musically in French what food and entertainment is to come. Behind him is a flame-thrower, to his side a couple of acrobats, all while musicians serenade the hungry crowd. The tempting aroma of food is quickly followed by bowl upon bowl of simmering soups, caloric casseroles and decadent desserts, each time ported on huge wooden trestles by two muscled men, straining to carry the weight of such exquisite French food for the masses. There are ample quantities of Hipocris, a medieval style French mulled wine to wash it all down as you lick the food from your fingertips, so tasty that you don’t want to lose a morsel. This three-hour feast ensures you don’t go home hungry; on the contrary, you probably won’t be able to eat for a week! The kids will be delighted with their literal finger food and you’ll be deemed the best parents in the world. Worth every cent!